An endless curse. An unstoppable killer. A legacy reborn. 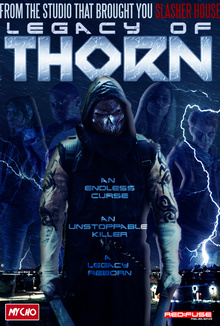 4 years ago on February 29th... Jessica Lawrence and her friends lived a nightmare that has left her pursued from that moment by the unstoppable Killer known as Thorn... Four years on, Jessica and a band of survivors from that night make an attempt to stop him once and for all... but how can you stop what can't be stopped? Legacy of Thorn HD Download complete with Special Features.